A record number of close to 100 women won seats in the US House of Representatives in the high-stakes 2018 midterm elections, a massive victory for female candidates across the political spectrum. As of early Wednesday, CNN had projected 98 women would win House races, with 33 women newly elected to the House. This number bests the previous record of 85 representatives, according to the Congressional Research Service. Even as the last poll numbers were still coming in, there are still two outstanding races that have two women competing against each other, which means that at least 100 women will be serving in the House next year. On the Senate side, CNN projected that 12 women would win Senate seats, with two newly elected women joining nine female incumbents. Eight women -- four incumbents and four non-incumbents -- would win races to the Governors' seats. CNN said the numbers in each category tilted largely to Democrats, with 84 of the projected female House winners coming from the Democratic Party and 14 from the Republican side. Arizona is poised to elect its first female senator no matter which party wins, which will add to the Senate tally above. "The historic totals capped off a campaign season in the wake of President Donald Trump's election that was defined in large part by female activism," the CNN report said. "The midterm elections saw women securing historic firsts around the country, from the first Native American women to join the House of Representatives to Tennessee electing a woman to the Senate for the first time," it said. 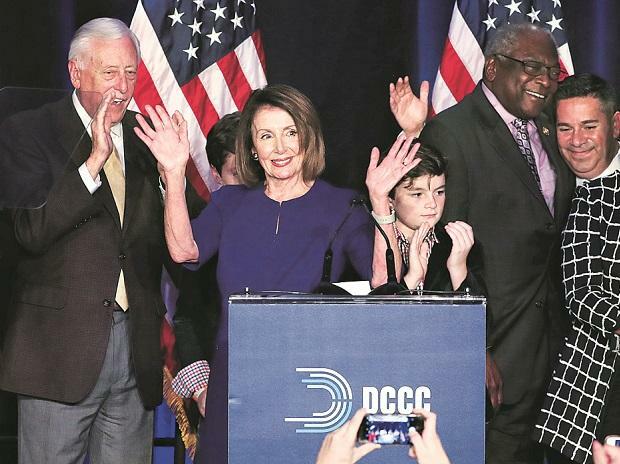 The high-stakes 2018 midterm elections in the US delivered several significant firsts as millions came out in record numbers to elect the first two Muslim women to Congress, the youngest woman ever in Congress and the nation's first openly gay governor. Ilhan Omar won in Minnesota's 5th Congressional District and Rashida Tlaib won in Michigan's 13th Congressional District. They are the first Muslim women elected to Congress. Michigan Democrat Tlaib and the Minnesota Democratic-Farmer-Labor Party's nominee Omar will secure their respective seats in strongly Democratic districts following primary victories earlier this year. Democrats Sharice Davids and Deb Haaland will become the first Native American women elected to Congress. Rep. Marsha Blackburn will win the race to represent Tennessee in the US Senate.